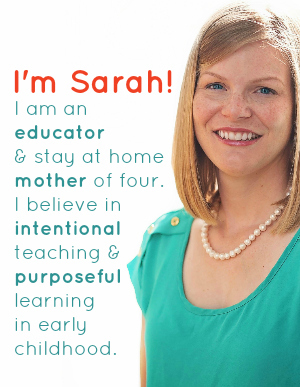 Young children not only love math, but they are naturally very good at it. 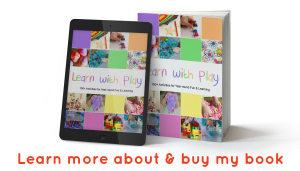 Ranging from counting and sorting to manipulating shapes and graphing, preschoolers and kindergartners especially seem to be wired like little mathematicians, and I love to refer to them as such. Luckily for them, math is all around them in their natural world. 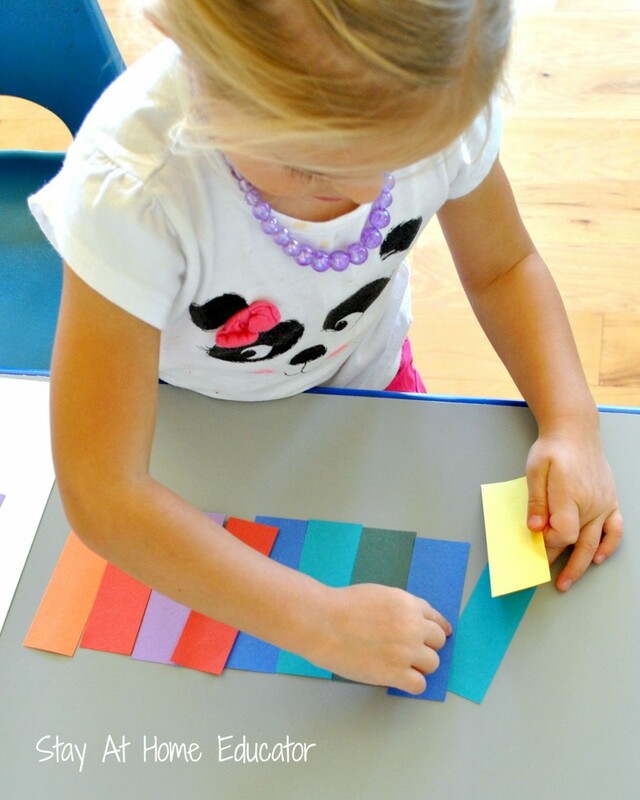 This activity, Partner Pieces, not only builds their sense of measurement by the use of math manipulatives, but it also introduces preschoolers to the concepts of measurement in their environment. While this activity is certainly appropriate for preschoolers and definately for kindergartners, I did a trial run with Corinne (three years) and William (five years) before formally introducing it to my preschool class of 3-4’s. Corinne was much more enthusiastic about finding matching lengths, but the activity was also challenging enough for William to benefit from it as well. The following are some picture books that pair nicely in a math unit about measurement. 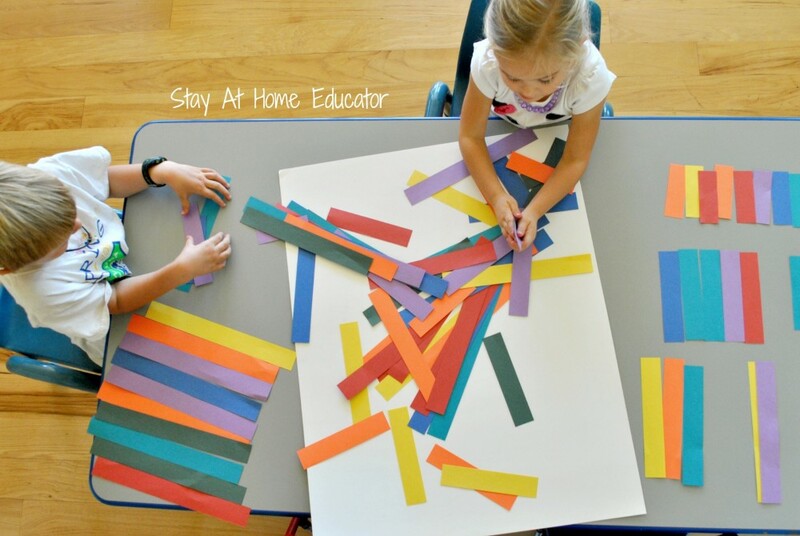 To set up this activity, cut strips of construction papers one and a half inches wide. I used a rainbow of colors to end up with several strips per piece of paper. Then, take one set of strips and cut it down by one and a half inches. Do the same with a second set of strips, and continue until all the strips have been cut down one and a half inches shorter than the last, like the picture below. 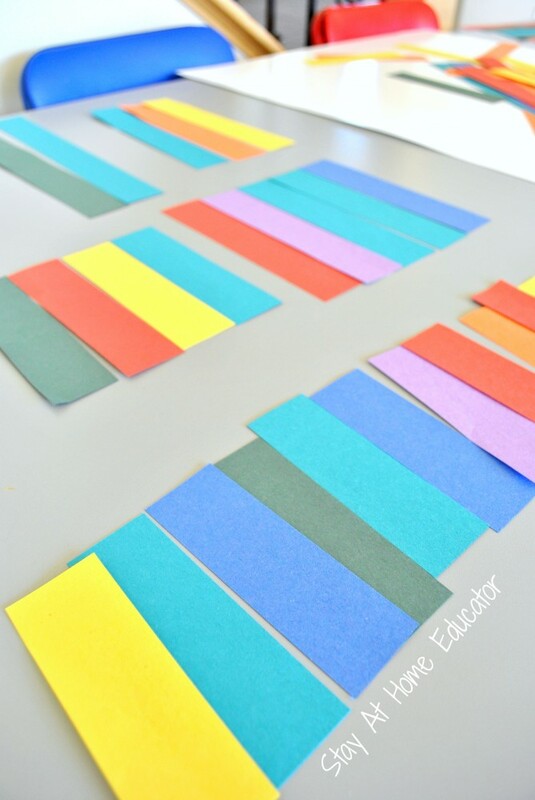 The idea is to have two strips of the same size for each color. Once all the strips have been cut to size, they can be laminated for added durability. Or, if you’re feeling a little lazy like I was, they can be left as is. Finally, set up the activity by scattering the pieces on a mat. I used a sheet of white poster board. This mat is important as it gives the children boundaries for the unmatched pieces, and it helps them establish a work space for their matches. 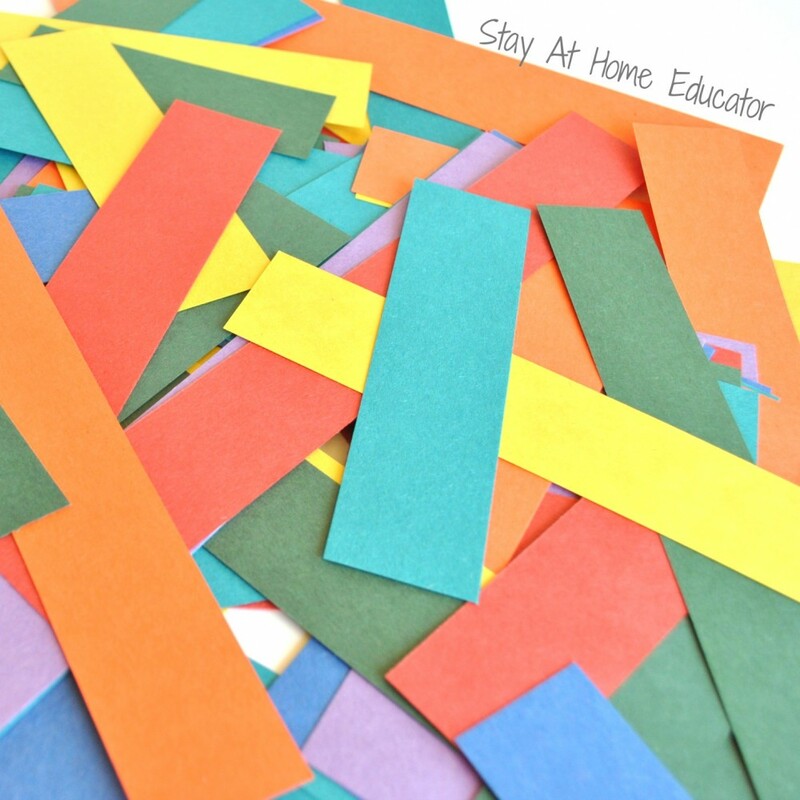 Just an added note, using two sheets of each color of construction paper makes a lot of strips. 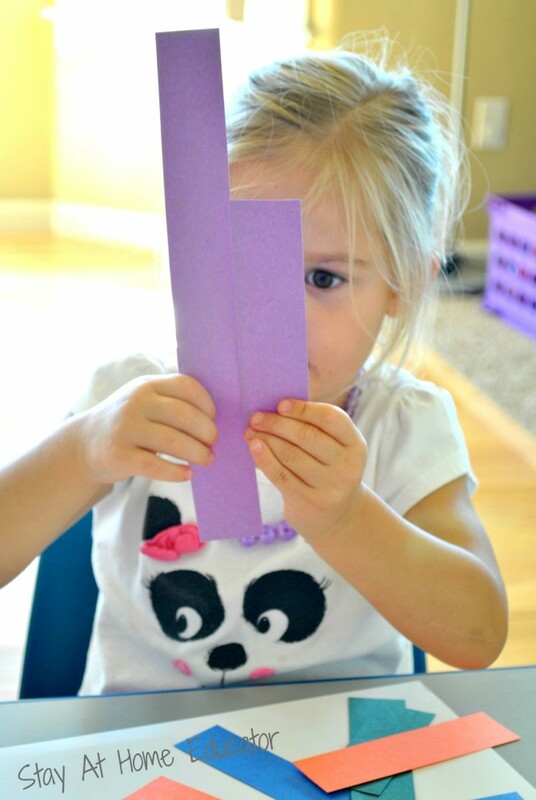 If you’re preparing this activity for just your child, you may find that half the amount is more appropriate. Once the pieces were scattered about on the mat, I invited William and Corinne to find the matches. 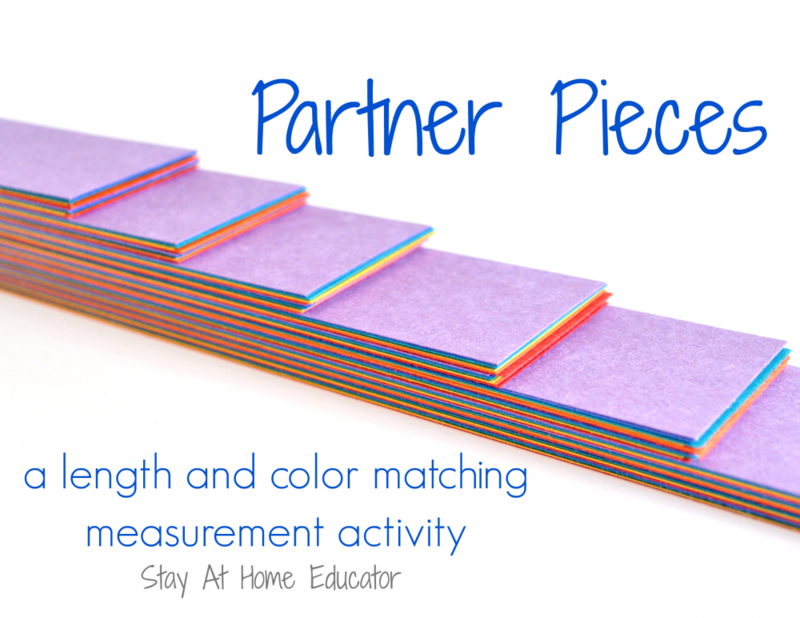 Since this was their first experience with this partner pieces activity, I allowed them to find the matching pieces by just choosing to match the length, or they could also choose to match the length and color. William set about sorting strips into piles of color, while Corinne began by finding pieces that matched in length, but maybe not color. And she quickly set about lining up all the matching lengths in her work space on the table. Instead of just looking for individual matching sets, Corinne choose to sort through all the strips in an effort to find as many of the same matching length as possible. Corinne continued this method of sorting and matching until throughout the entire activity. During our partner pieces activity, I had plenty of opportunity to facilitate some mathematical discussion. The following are a few questions to consider. Can you find the matching length? Can you find the matching color and length? How do you know those two pieces match? The most valuable thing you can do when initiating mathematical discussions is allowing your child to answer at length and allow them time for self correction. This promotes mathematical reasoning. Eventually, Corinne ended up with a collection of partner pieces that she arranged in groups by length. 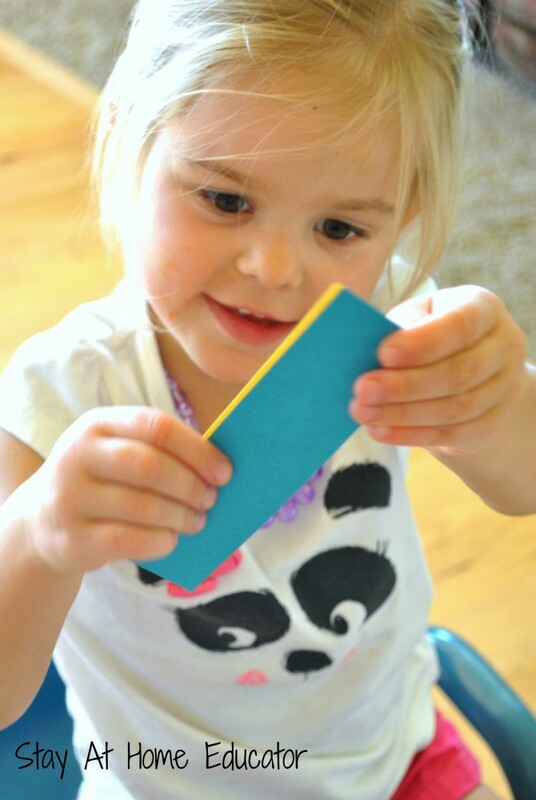 Once the pieces have all been matched, the activity can easily be extended by invited the children to find items in their environment that match specific paper strips. This in itself can be extended to a greater mathematical discussion in comparing lengths of the various items found in the environment. 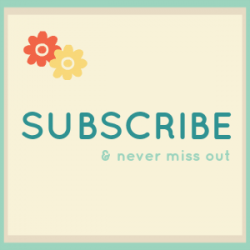 Here are some of my favorite products and resources for teaching young children about measurement.